So it's been quite some time and after a few people asking it's never a better time to start a blog than to get behind something dear to my heart. I love the women who have shaped my life in ways I can't even begin to understand but I will try in a brief post for this fine day. Let's make no qualms with this posting, this is not a countdown in any particular order per say but more of a personal acknowledgment of women I have known and admire for their iniquities unto their own powerful senses that have captured my fascination and admiration. Barbara Earl Thomas is a visual artist, a writer, and a community activist with a longstanding record as an arts administrator. She has overseen programs for Seattle’s Department of Arts and Cultural Affairs, Bumbershoot a Seattle Arts Festival, and the Northwest African American Museum where she served as executive director from 2008-2013. I met Barbara when she was a consulting artist to a small group of artists seeking know how of how to survive the business of art. She opened with a story as a child making art that made her grandmother smile which in turn made her feel good about herself and I was hooked. She was the first woman I met in the art world to mentor with absolute honesty about the day to day reality of being an artist for a profession and all it would entail. She and her work are both powerful as they are captivating. Clarissa Rizal was an amazing artist who left us too soon. She was a member of the Tlingit weaving community apprentice of Jennie Thlunaut. Her work in woven material both customary in the way of Robes and regalia were and remain exceptional. Her fearlessness to explore her artistic creative appetite lead to great break throughs and I was ever so fortunate to learn from her openness about that creative process. Her work is significant to the weaving community and her absence is very much felt in her recent passing but she serves undoubtedly as an inspiration in the legacy she left for us to learn from. Ramona Bennett is a member of the Puyallup Tribe. She is one of many tribal members who collectively helped to ensure the rights that so many sacrificed their lives for. Ramona has been an activist for much of her life and a major spearhead in securing fishing rights for the Puget Sound tribes. 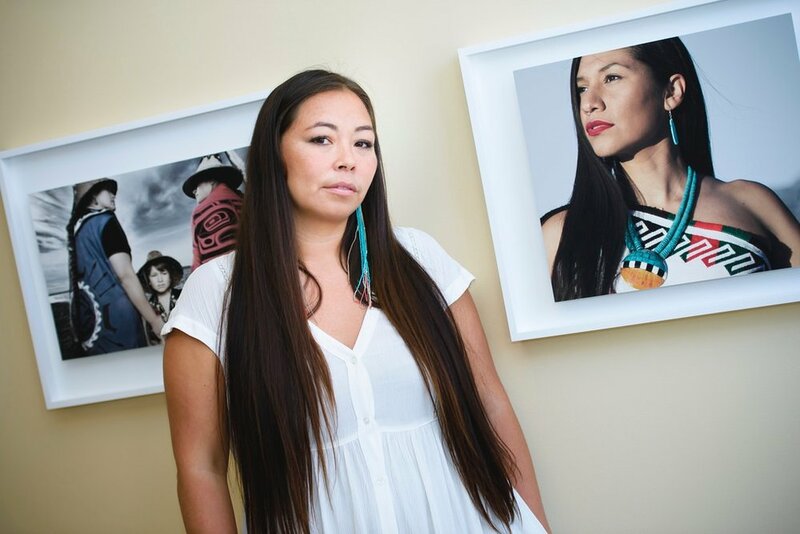 She continues to be an instrumental figure including the recent need for awareness when it has come to #IdleNoMore and #NoDAPL. I had the pleasure to visit with her at an event hosted in Muckleshoot that acknowledged the warriors who fought to defend the territory and rights of our Native people in which she was acknowledged as a true bearer of the torch in keeping that alive. Matika, a Native American woman of the Swinomish and Tulalip Tribes (Washington), is unique as an artist and social documentarian in Indian Country- The insight, depth, and passion with which she explores the contemporary Native identity and experience are communicated through the impeccable artistry of each of her silver gelatin photographs. I had the honor and privilege to create the logo for her 562 project that has gained world status acclaim. Her project has a goal to document all Native Nations of the United States in a collective that will give voice that Native people are very much a part of the modern world and will share their stories with a fellow Native citizen that will acknowledge them in a way that perhaps others could not and share that with the world. For anyone who ventures or takes interest in Coast Salish art, it's understood it would not be where it is without her high driving ambition to create works of art that carry that heritage. Susan proved that carving is not strictly a mans arena but that she could really dig in and make waves. Founder of Quwutsun made Arianna has shown change starts by start up. Although it's only been a short time since she's launched her line of products she's made an impression in her community and has a promising future where the sky is the limit. She's modeled for various designers and continues to explore the creative fields of opportunity as a force of nature and ambition. If there were a secret to my success in life and this career I have come into, it wasn't just hard work alone although that was a large part. I learned to work hard from the women who raised me. They have taught me all I know about love, life and forgiveness and understanding. I was blessed in this life to be born into a family and even more so a tribe of strong women leadership that goes back many generations. There are so many women in my family they all know who they are and I've grown up to see them become amazing mothers and at times still have the strength of our grandmother to call me out when I need to be brought in line with our teachings. It's impossible to capture all the women who have changed the world and continue to so I can only share a snapshot before I lose your attention with what came to mind on this day in March 2017.